iOS 4, iBooks Available Today from iTunes – Let the multitasking begin! In case you’ve missed it, both iOS 4 (formerly known as iPhone OS 4) and iBooks are available for download and installation today from iTunes. iBooks has been available on the iPad for some time now (since it’s launch) and Apple has made good on its promise to bring it to the iPhone/iPod platform. However, probably the bigger news of the available downloads today is that of iOS 4 for iPhone 3GS, 3G, iPod Touch 2nd & 3rd Generations. Original iPhone and iPod owners are out of luck for iOS 4, but that shouldn’t be news or a surprise to anyone. iOS 4 brings over 100 new features and enhancements but of these the most anticipated feature is multitasking. Multitasking alone on the iOS has multiple features that app developers can leverage to enhance their applications. Among the multitasking features available is the ability to run VoIP apps in the background, stream music (a la Pandora) and many others that us iPhone owners have been anxiously awaiting for. Be sure you have an hour or more to give to the upgrade process as you will use every minute of it. Don’t be rushed as the process will not be fast. Know that a full backup, sync, iOS install, restore and resync can take considerable time (1:45 for me). Backup, backup, backup. Before doing any OS update, backup your iDevice. To backup, right-click (or command-click) your device in iTunes and select “Backup” from the menu. Sync you device. You should do a full sync of your device so make sure your contacts, etc are up to date on your computer. Syncing your device also allows you to easily re-install all of the apps you have on your gadget. If you’re like me, you’re installing and uninstalling apps right from the phone, which means any sync data on the computer is way out of whack. Syncing the apps and other data means that once the device is restored and synced again then it should be exactly how it was before the update. Note: Know that not all iOS udpates will be problem free and some will require a full restore (hence the two above). Our experience? Well, let’s just say I went the whole restore and resync method to get my iPhone up and running correctly on iOS 4. So having the backup and recent sync of my idevice made the process pretty smooth, even if it did take well over an hour. iBooks was also expected to launch onto our iDevices today, which it did. The iBooks apps is now a Universal app (supports iPad and iPhone), it just wasn’t available for iPhone until iOS launched today for the masses. 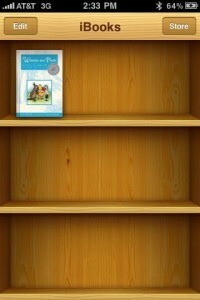 Once I installed it the app automatically synced all of the books I had purchased on my iPad. I haven’t spent much time with iBooks for iPhone but the interface is very similar to the iPad version.